We’re bringing the Sunday Poem out of hiatus and will hopefully, with some publisher cooperation, feature some remarkable poetry by contemporary poets who work with science metaphors. However, before we return to present day poetry, let’s go back two thousand years and tackle the greatest of all science poems: Lucretius’ The Nature of Things. Why should you read Lucretius? His poem is one of the great works of classical Latin poetry, one which influenced many subsequent Roman poets, notably Virgil. It has the added benefit of laying out Lucretius’ remarkable thinking about the invisible workings of nature. Reading this poem, you inhabit the ancient mind of a sharp observer who was trying to make sense of the macroscopic world by theorizing about motions of the microscopic one. Lucretius was conscious of the requirements of good science writing. He was explicitly an advocate of the Mary Poppins method of helping the medicine go down with a spoon full of sugar. Lucretius packed his poem with illuminating metaphors and, like Darwin, was capable of making striking observations of everyday phenomena that most of us would take for granted. He used these observations to make inferences about the world we can’t see. As an advocate of the teachings of Epicurus, Lurcetius connects his observations and inferences to crucial ideas about how we should live our lives and think about ourselves. Of all the great poems of Europe – and it is indeed among the greatest – Lucretius’ De Rerum Natura (The Nature of Things) is perhaps the most improbable. Here is a poem without people in it, without any story; instead it offers a treatise on science and philosophy. The philosophy, moreover, is a strict materialism, which denies the existence of anything magical, mysterious, or transcendent. It does not sound like promising matter for poetry at all, let alone for a work of more than 7,000 line. Yet the result is a masterpiece. A key to appreciating this most unlikely success is to understand the nature of Lucretius’ beliefs and the circumstances in which he decided to expound them. And far in all directions, measureless on every side. And make up savage iron and other substances of this kind. Providing us with thin air and the shining of the sun. Ceaselessly separating and regathering in groups. Among the atoms that are tossed about in empty space. Drifting now in this direction, now that, on every side. Although the blows that move them can’t be seen by anyone. The richness of passages like this doesn’t come from the parlor game of seeing how close Lucretius came to our modern concepts; much of the value lies in following the poet’s relentlessly searching train of thought as he struggles to make sense of the world we observe. His sharp eye for detail is matched by his vigorous, inventive imagination. This entry was posted in Follies of the Human Condition and tagged Lucretius, science poetry, Sunday Poem. Bookmark the permalink. I might have this book, you make me want to go searching for it! I also like your choice of art to illustrate the post. I forgot to put a caption under the picture – it’s from a fresco from the Villa of Livia, painted, I gather, not too far from Lucretius’ lifetime in the first century BCE. 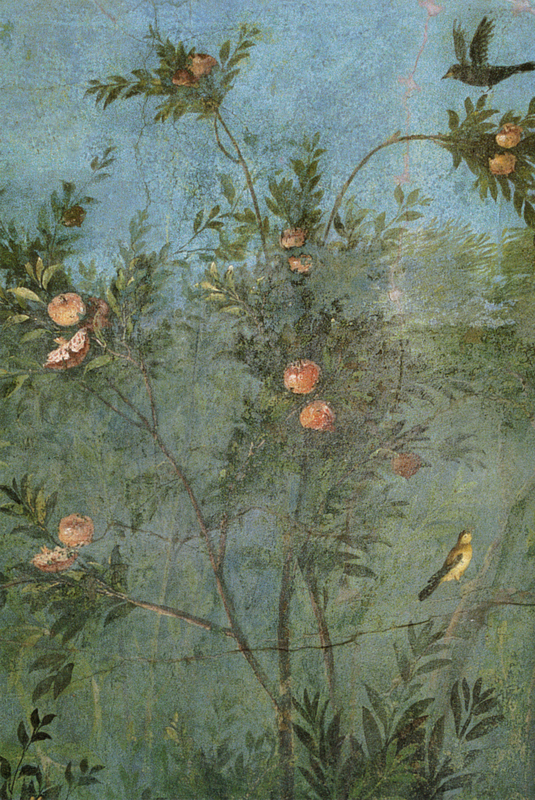 Roman still life frescos are amazing. Also – it seems as though Herodotus gets all the attention these days, nice to see someone else get some attention! Except for Virgil and Ovid, it seems like the Romans in general get neglected. My Latin is quite rusty now, but if I was to read this poem I think I’d want to look for a Latin version to read/struggle with alongside the translation – it’d be interesting to see what terms Lucretius has to invent, and how the conspicuously modern terms compare to the original Latin. Now I’m feeling intimidated amongst all of you who read Latin. My high school offered it, taught by a teacher who was a living version of every single Latin teacher cliché you can imagine, and so I avoided it.